A busy steel fabrication company in the Northeast contracted with a customer for a project that promised increased revenue over the coming year. The steel fabrication company, which specializes in manufacturing steel products for major construction projects, would produce I beams for their customer’s new venture. The problem was that the massive number of hot steel products required for the project needed an immense covered staging zone. Nothing currently existed on site to protect the beams from the elements while they cooled and until it was time for shipping to the construction site. This called for an ideal solution…FAST. As a leading global steel manufacturer, the fabricator had a reputation of excellence to uphold. The project was set to begin production the first of the year, and it was now late September. 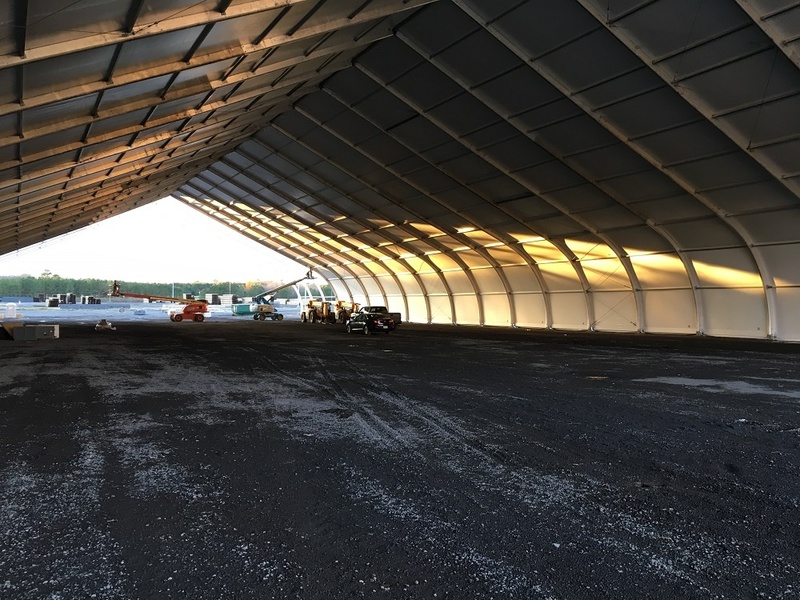 The clock was ticking toward a hard deadline with no decision made as to what type temporary structure could handle the job or who would install it. An extensive search to find a suitable partner led the fabrication company to Mahaffey Fabric Structures. Mahaffey’s reputation in the industry, professional installation teams, expert project managers, leasing flexibility, and, best of all, our turnkey installation capabilities, were key reasons we were selected. 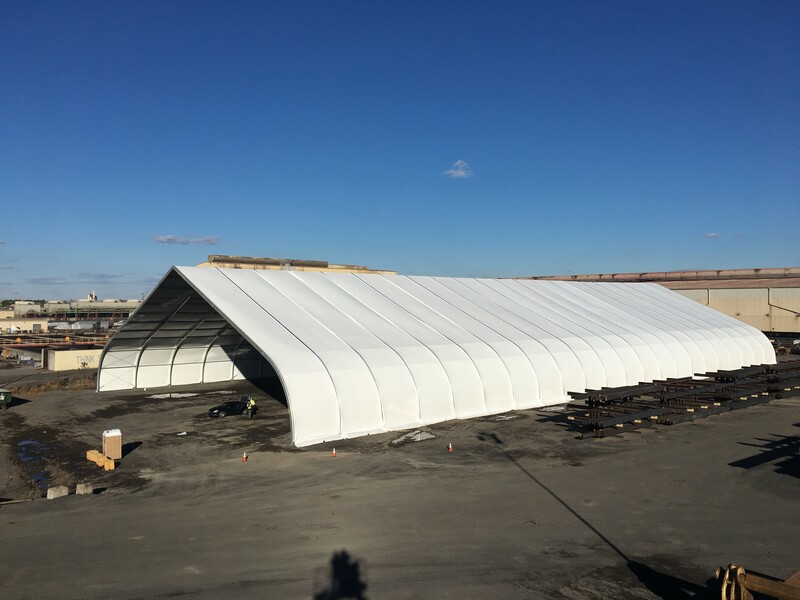 One of the greatest challenges for the steel fabricator was finding a vendor who could get the temporary structure up and running as a staging area by the end of the year. The steel beams needed to be moved from the fabrication area directly into the covered structure, where they could cool without being affected by precipitation. This meant the structure had to be installed in close proximity to the fabrication facility. The product run would continue over the next year, so the structure needed to be durable enough to withstand harsh elements like heavy snow loads for an extended timeframe. Additionally, plenty of room was required for the I beams to cool. Could handle snow loads required for the county. Was approximately 56,000 sq. ft. of space. Had open ends and was easily accessible from the fabrication area. Could be installed with no foundation and become quickly operational. Could remain on site 12 months. An initial site visit by Mahffey’s project manager and field supervisor yielded photographs, measurements and architectural drawings supplied by the client. The plan Mahaffey proposed included a mega-tunnel design using the Mahaffey Tension Series (MTS) ® product. The MTS is a versatile design that features a peaked arch profile ideal for shedding snow. Not only did this design allow plenty of interior staging space, it provided plenty of height for forklifts to navigate. Additionally, the “open-ended” design allowed easy access for personnel and equipment. Supplementary bracing was included to reinforce the structure and accommodate heavy snow and wind loads. MTS structures are ideally suited for projects lasting twelve months or more. MTS structures can be installed quickly on the existing ground surface, with no need of a poured foundation. Mahaffey’s final proposal came complete with a detailed timeline that allowed the fabricator to plan their production schedule accordingly. The mega-tunnel design was a success. The entire planning process was accomplished within thirty days. Mahaffey’s team mobilized quickly for an installation that lasted approximately two weeks. A challenging aspect of this unique project was the mixture of gravel, steel shavings and other byproduct that comprised the surface of the steel yard. This made the ground very hard, which could make it difficult for a less experienced vendor to drive the stakes to anchor the structure. Mahaffey’s team has years of experience and understands the importance of flexibility in the field. Our team was able to adapt quickly, and the mega-tunnel was ready to use as a cooling station in plenty of time for the production run to begin. Mahaffey’s ability to quickly mobilize, troubleshoot in the field, and maintain our proposed timeline allowed our client to begin their new customer’s project on time. Mahaffey finds solutions to make your job easier. We have years of experience setting up extreme weather structures, temporary warehouse structures, and base-camp structures. We can mobilize and execute in a few days. The “ask” is never too big for Mahaffey to answer. If you have a tall order and need a partner that’s quick, reliable, and professional, call our expert project managers at Mahaffey.